St. John The Baptist Church Great Bolas. Walk begins at 10.30 am at Waters Upton Church. St. Michael's Church Waters Upton 9.15am. The First World War memorial to the fallen of Waters Upton is a brass plaque placed on the North Wall of the nave. LIEUT: G.H. DAVIES, 3RD K. SHROPSHIRE L.I. 2ND LIEUT: W.LL. DAVIES, 7TH K. SHROPS. L.I. PRIVATE, W. JAMES, K. LIVERPOOL REGT. PRIVATE, J.T. 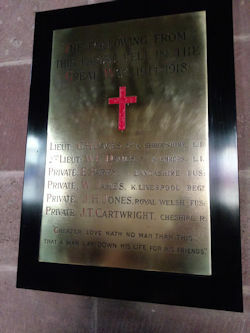 CARTWRIGHT, CHESHIRE R.
THAT A MAN LAY DOWN HIS LIFE FOR HIS FRIENDS"
Lieutenant George Herbert Davies and Second Lieutenant Walter Llewellyn Davies were brothers and sons of the Revd. J. B. Davies,(Dec'd 1905), Rector of Waters Upton 1866-1905. George Herbert was killed in action on 9th August, 1915 at Ypres, Belgium age 26 years, his memorial is on the Menin Gate. Walter Llewellyn was killed in action on 15th July, 1916 at the Somme age 34 years, he was buried at La Neuville British Cemetery, Corbie, France. Private Edward Parry the Sub-Postmaster at Waters Upton was killed in action on 30th September, 1918 age 39 years, he was buried at the Uplands Cemetery, Magny-la-Fosse, France. Private William James of 32, Waters Upton, was killed in action on 17th November, 1917 at the Somme age 30 years, he was buried at the Tincourt New British Cemetery, Picardie, France. Private John Herbert Jones also of 32, Waters Upton, was killed in action on 1st September, 1918 at the Somme age 28 years, he was buried at Caterpillar Valley Cemetery. Longueval, Somme, France. Private John Thomas Cartwright of 2, Waters Upton, was killed in action on 27th March, 1918 at the Somme age 19 years, he was buried at Pozieres Memorial, Somme, France. 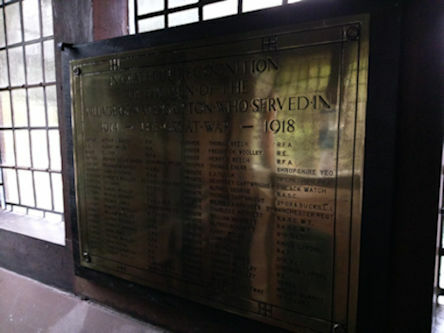 There is also a brass plaque placed of the eastside of the porch in "Grateful recognition of the men of the village who served in the Great War". It has 40 names and also records that at the time there were 162 people in Waters Upton. Copyright © 2019 St. Michael's Church PCC. All Rights Reserved.